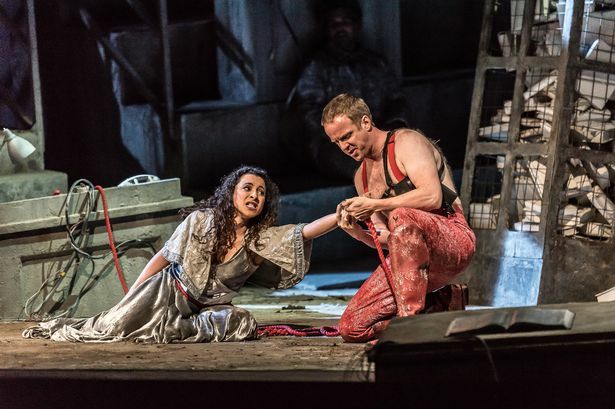 Welsh National Opera’s autumn season in Birmingham next week is an interesting mix of two well-loved works and two lesser-known ones (though none the less rewarding for that). The company’s lively, well-designed production of Johann Strauss’ Die Fledermaus is perhaps the odd-one-out in an otherwise Slavic menu (OK, one could argue that the scheming heroine Rosalind passes herself off as an Hungarian countess), and the other repertoire favourite is Tchaikovsky’s setting of Pushkin’s heartbreaking Eugene Onegin. From the Byronic Pushkin we move to the sombre Dostoevsky for Janacek’s From the House of the Dead, with its almost exclusively all-male cast, set within a Siberian prison camp. A previous WNO production featured at its ending a real eagle flying out from this grim incarceration as a symbol of soaring hope. It was a magical moment. Equally thought-provoking stuff comes in Mussorgsky’s Khovanschina, muscularly detailing the struggles between old and new factions during the reforming reign of Peter the Great as Tsar of Russia during the concluding decades of the 17th century. I reviewed a revival of the original UK production of this powerful opera at the Royal Opera House in Covent Garden in the very early 1970s, and Birmingham audiences will most recently have encountered the work in Birmingham Opera Company’s absorbing Khovanshygate a few years ago in a huge marquee within Cannon Hill Park, the CBSO accompanying this community enterprise directed by Graham Vick. Amidst all the political and religious intrigue going on in Khovanschina is a love-interest revolving around a German girl, Emma, and Welsh National Opera’s current presentation brings soprano Claire Wild in the role back to her home territory. “I was born and grew up in Birmingham, and went to Great Barr School,” Claire tells me. Claire’s repertoire is huge, covering a great range of styles across the centuries. Does she make conscious gifts in approach, according to whichever genre? “The genre doesn’t change the way I approach the music technically,” she says. “Whether it’s Mozart, Poulenc, Janacek, Cole Porter or Errollyn Wallen, I learn music the same way. Does her head get into a different mindset, according as to whether she is singing in Russian, Italian, German, English, or whatever? “Yes, absolutely! Particularly if it’s a language you’ve not sung in before,” she says. “This is my first Russian role and I had to learn how to pronounce the words before I began to look at the music. When singing in another language it’s important to learn the correct pronunciation with a language coach and then translate it. Which is one of the most interesting points I’ve ever heard made by an opera-singer, someone who takes her company work very seriously indeed. October 31 - Khovanschina (7pm). November 1 – Die Fledermaus (7.15pm). November 2 – From the House of the Dead (7.30pm). November 3 – Eugene Onegin (7pm). November 4 – Die Fledermaus (3.30pm). All details on 0844 338 5000.